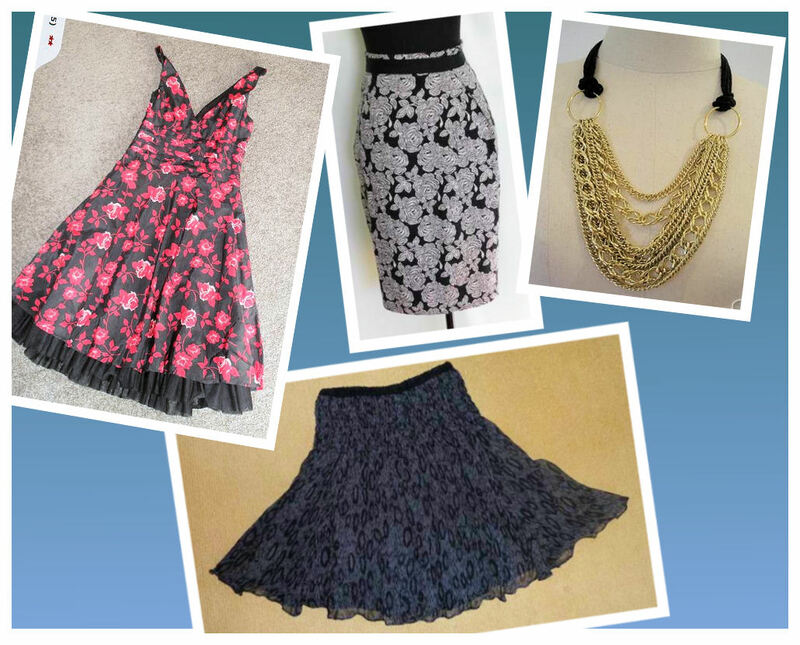 Do you want to see my latest Trademe fashion purchases? For $100, I bought all of the above items. I love, love, love the bottom skirt . It is by Storm and pure silk – soft and floaty. It is in perfect condition and cost me all of $15.50. The colourful, flirty dress is by Portmans and I bought it for $30. With a snappy black jacket, it is perfect for work. I haven’t worn the necklace yet ($11.01) but I can imagine it on a plain black skivvy or with a white, open-neck shirt. The other skirt is gorgeous and also in great condition but it was the one I told you about a few posts ago. The trader had made a mistake with the measurements and sent me the wrong skirt – it was far too big for me. With complete co-operation the trader refunded me my money plus all postage costs and I returned the skirt. I have since sold two jackets and easily recouped the amount I spent on these four items. An ever-changing wardrobe for no cost. What could be better than that for a fashion lover? The catwalks are rampant with lace and it’s just gorgeous, unlike anything we’ve seen before. I could live in some of these dresses. I have scoured Trademe for similar dresses and have found some but nothing can match these designer garments. However, click on the links and see the nice cheap prices and then think of what those designer equivalents would cost you and bid at the auctions and try to emulate Scarlett Johansson in all her glory (see below). For a while now I have been following a fellow fashion blogger called The Glamourai and yesterday I saw that she had partnered with Portmans to model some of their latest range. I have chosen the outfit I covet the most and you can go to the Portmans website to find the individual garments. Then I have found garments on Trademe to recreate a version of the outfit. Recreating it exactly would be impossible but the idea is the same. Here we go. Find the garments at these links: Jacket, Top, Scarf, Pants, Shoes. As a bonus I have put together one of the other looks that Kelly Framel from The Glamourai wore. This comes in a close second. Pleated chiffon skirts, short, long and mid-length, are right on trend right now. You can find heaps of celebrities in them, creating all sorts of different looks. Wear one with a twin set and pearls for a sweet, retro look or grunge it up with boots and an edgy jacket. I went onto Trademe to see what pleated chiffon skirts I could find and came up with these. To find these garments follow these links: long black skirt – size 10, long cream skirt – sizes 6-10, Supre black mini – size 10, raspberry mini – size 6. Find this skirt here. Size 10. In 1853, the California gold rush was in full swing, and everyday items were in short supply. Levi Strauss, a 24-year-old German immigrant, left New York for San Francisco with a small supply of dry goods with the intention of opening a branch of his brother’s New York dry goods business. Shortly after his arrival, a prospector wanted to know what Mr. Strauss was selling. When Strauss told him he had rough canvas to use for tents and wagon covers, the prospector said, “You should have brought pants!,” saying he couldn’t find a pair of pants strong enough to last. Levi Strauss had the canvas made into waist overalls. Miners liked the pants, but complained that they tended to chafe. Levi Strauss substituted a twilled cotton cloth from France called “serge de Nimes.” The fabric later became known as denim and the pants were nicknamed blue jeans. In 1873, Levi Strauss & Company began using the pocket stitch design. Levi Strauss and Nevada tailor David Jacobs co-patented the process of putting rivets in pants for strength. On May 20, 1873, they received U.S.Patent No.139,121. This date is now considered the official birthday of “blue jeans.” Source. Since then denim has mutated through time to become what it is today – an element of fashion which is forever on trend. I had a look on Trademe and came up with the following garments. I have chosen another picture from The Sartorialist blog to recreate using first garments from Trademe and then from local shops. You can find these garments for auction here: shirt, jacket, boots, hat . The hat is from Dotti, the blouse from Ezibuy, the jacket from Portmans, the boots from Overland, the ring from Sussan and the earrings from Storm. I then created it in that online site I have mentioned, Looklet.com and this was the result. I love this site. The website, The Sartorialist, shows photos of people snapped in the streets of the world’s main cities. This is a recent one which caught my eye. I have recreated this look first from garments up for auction on Trademe and then from shops near you. I couldn’t find a cream voile skirt on Trademe so pink it is. For variety I changed all the colours for the shop outfit. Here are the links from Trademe: Blazer, Skirt, bag, boots. And here are the links for these items: Blazer (Jacqui-E), Skirt (Glassons), Bag (Country Road), Shoes (Hannahs). It might be the dip in temperature today but I had an urge for red and scoured Trademe for red dresses in particular. Many people display their garments so badly on Trademe that I wouldn’t pick them up and use them on my blog. A wrinkled garment laid flat on the ground is not going to show anyone the shape or fit of the item and who would buy something under those circumstances? No one. The way you display your for-sale items is crucial not only to the price they will fetch but also to whether they sell at all. Hence I haven’t got a great number of dresses to show you but the ones I have chosen have a certain appeal and could be well worth a look if they are your size. Follow the links below. Do you want a Moochi garment at a fraction of the price? Moochi is one of those middle of the road labels as far as cost is concerned but it might still be above the means of many ordinary folk. If you wish to wear one of their stylish, right-on-trend garments, check out those on Trademe. I have chosen those that have great reserves though there are more at higher prices. If you want to check them out, click on the links below.